Looking for a unique wedding favor? How about something delicious and local to add to your in-room welcome bags for out-of-town guests? Treat Bake Shop offers just that with their spiced pecans. The business focuses on sourcing the highest-quality ingredients to produce baked goods delivered with exceptional customer service. And for weddings, they’re one-of-a-kind. Owner Sarah Marx Feldner works with couples to ensure their wedding days turn out exactly how they envisioned. The Shop is happy to personalize the pecans with packaging to fit the wedding theme. And because of the company name, it allows for a fun play on words. For example: “We’re nuts for each other” or “You’re a Treat”. Pecan packages can be used individually as favors for each of your guests. Another idea is to add them to in-room welcome bags. “Especailly if it’s a Wisconsin wedding, I’d suggest completing the welcome bag with other Wisconsin food artisans,” Sarah said. She suggests visiting the Wisconsin Artisan Food Producers Association for ideas. 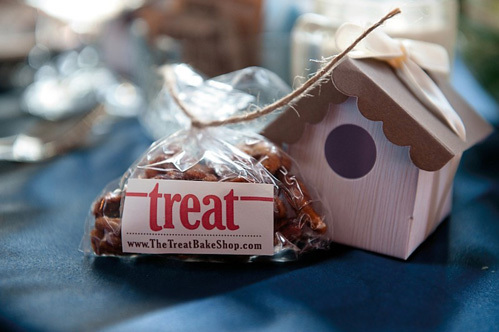 If you’re interested in using items from Treat Bake Shop for your wedding, contact Sarah directly online.